The HP 1Gb Ethernet Pass-Thru Module for c-Class BladeSystem is designed for those customers desiring an unmanaged direct connection between each server blade within the enclosure and an external network device such as a switch, router or hub. 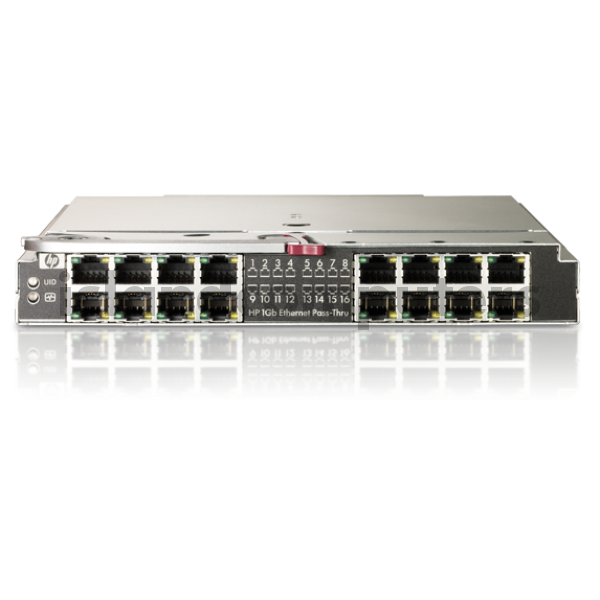 Ideal for datacenters with existing network infrastructure, the HP 1Gb Ethernet Pass-Thru Module delivers sixteen internal 1Gb downlinks and sixteen external 1Gb RJ-45 copper uplinks, providing a 1:1 non-switched, non-blocking path between the server and the network. Designed to fit into a single I/O bay of the c-Class enclosure, the Ethernet Pass-Thru Module should be installed in pairs to provide redundant uplink paths to your network. Do you have any questions about 406740-B21 HP 1GB Ethernet Pass-Thru Module for c-Class BladeSystem?